Grin and BEAR "I.T." | Giving back to my PLN! Giving back to my PLN! 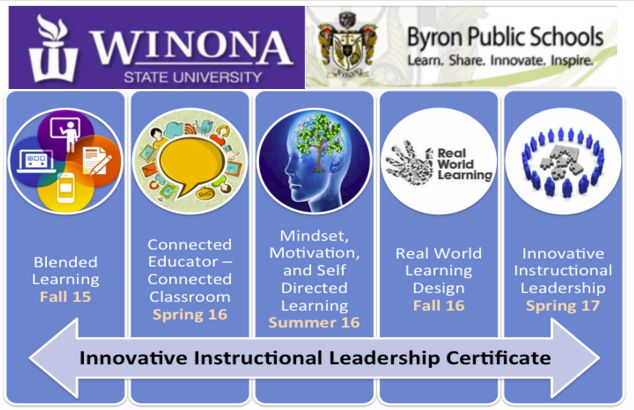 One of my recent accomplishments is to be working with Winona State University (WSU) in the development of the Innovative Instructional Leadership Certificate Program. This is a graduate level certificate and can be an “emphasis” area in WSU’s M.S. Education Leadership Program. Throughout this process, I always had the intent of putting an creative commons license on my work. Many districts across our state do not have the resources to develop these types of courses or the resources to pay for this type of training. Other entities, like higher ed teacher prep programs, regional trainers, ect are also free to use however little or much they need from my course. My goal, develop the courses, have a cohort go through them, and then publish the courses for others to use, adapt, and share alike! What better time, than the day I received my award, to give the 1st course away. I just finished course 1 of 5 and I am extremely happy with the outcome! You can check out my learner’s ePortfolios to see some of the paths they chose to take. If you want to take a look at the course (or download), Blended Learning Environments, please visit by going to bit.ly/BLE-CC. Use the guest login to access. Any questions? Feel free to reach me at @jenhegna! This is among the most well-deserved awards TIES has ever given. 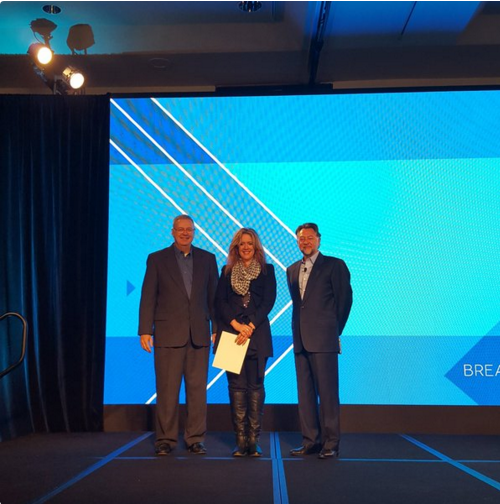 You are remarkable technology leader and we in Minnesota are lucky to have you. But don’t rest on your laurels! Thanks Doug! You have and continue to greatly influence me! You actually were part of my first breakouts – with presenting at Memo (my first presentation outside of Byron) and co-designing those social media guidelines! Rest assured…I recognize I still have much MUCH learning to do! I also hope to follow your lead and continue to coach/mentor other aspiring technology leaders.